When it comes to stargazing and astronomy, West Australians are very lucky. WA is quickly becoming an iconic global astronomy destination because the stars and science are right on our doorstep. Being so isolated, WA has some of the darkest night skies on earth. Scientists and stargazers are coming from around the world to enjoy the amazing natural asset over our heads. WA has some of the best night skies in the world and some of the most remarkable places to view them from. 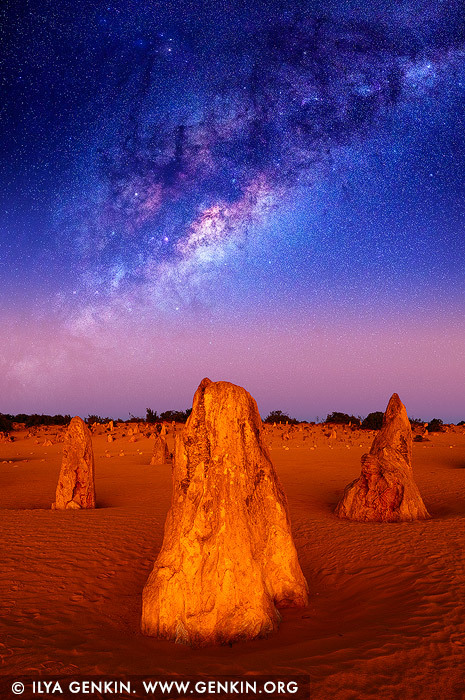 One of the best places to enjoy night sky is The Pinnacles Desert in Nambung National Park just north from Perth. This image belongs to the travel and nature stock photo library. This stock photo of Milky Way Over The Pinnacles Desert is available for licensing for commercial and editorial uses including websites, blogs, books, magazines, brochures and advertising. Restrictions may apply for images which contain third party copyrighted material or sensitive subjects. Photos of artwork are for editorial use only. This image id AU-NAMBUNG-PINNACLES-0003 of Milky Way Over The Pinnacles Desert, is copyrighted © by Ilya Genkin. This is not a public domain image.